Having received awards “Top Brand Award 2017” , now PT. 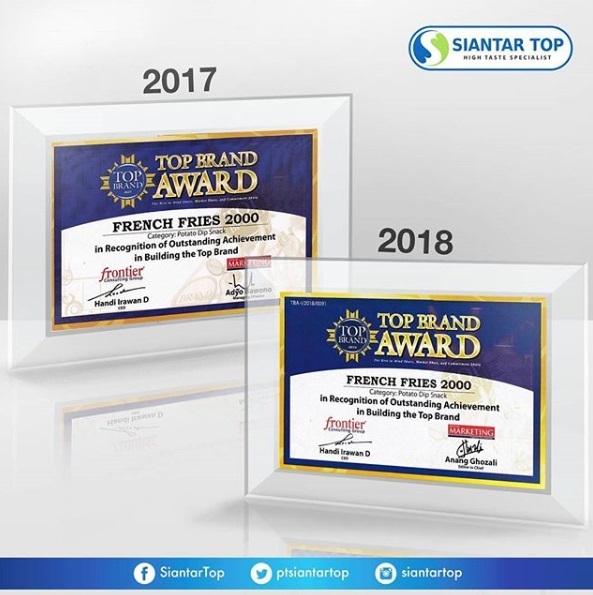 Siantar Top returns to get award “Top Brand Award 2018” Product of French Fries 2000. Thank you have trusted products of siantar top as a favorite great people . Yeeey .. again and again noodles for gemez products from siantar top choice to consumers snack noodles in Indonesia. Thank you for great people having chosen products from Siantar Top. PT. Siantar Top proudly returns to get award from infobank as “100 Fastest Growing Company Award 2017” on sub sector food and drink. Event fun run was held on Saturday, 8 July 2017 at Ciputra golf (Palimanan area) Surabaya, with the theme “the first thematic neon run at Surabaya”. It was followed by approximately 2000 participants consisting of children and adults. All participants have prepared to do running with the attributes provided by the committe, such as led bracelets and stick phosphorus colors. The event was started at 3.00 PM and at 4.30 PM the event was opened by the famous MC in Surabaya Abi Bayu and Raymond Stephen. In addition, there were 2 kinds of running categories, 5k and 10k. 10k runners started at 6.00 PM and 5k started at 6.15 PM. 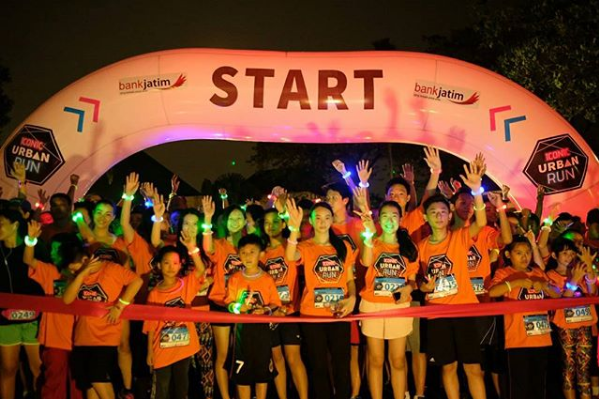 According to theme of the first thematic neon run, various colorful LED lights decorate the event location. In addition, the committe also provides UV bodypaint as the creation of the participants. 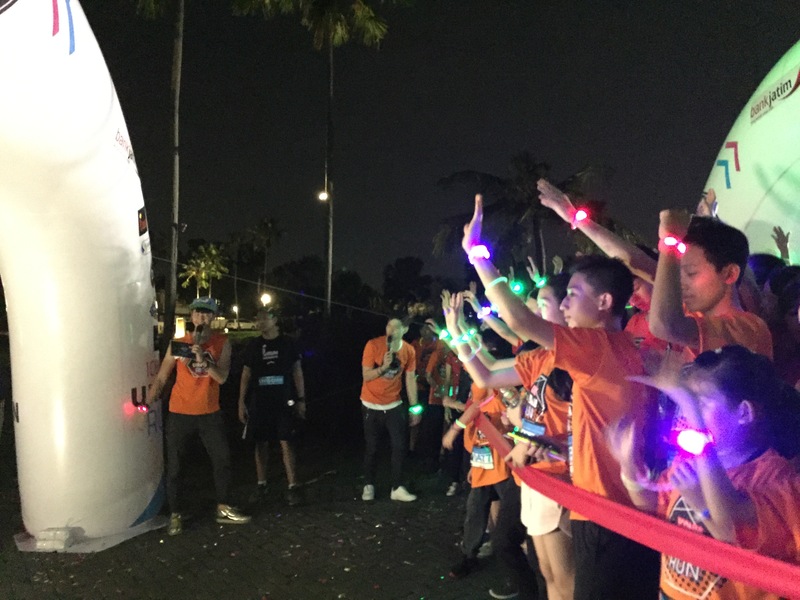 When the participants arrived at the Finish line, all participants got a metal medal and be welcomed by the appearance of DJ stainley, dance attraction, party glow stick and ballon party. There were also merchandises and voucher sponsors. Moreover, PT. Siantar top participated in the event by giving goodie bags which contains some of Siantar top products such as, Superman My choco fun, Superman My choco boom, twistko jagung bakar, french fries 2000, mie gemez Enaak, and Superman choco milk. August 17th becomes the most-awaited moment for the Indonesian people. Indonesian people has so many activities to commemorate the independence day. Usually, PT. 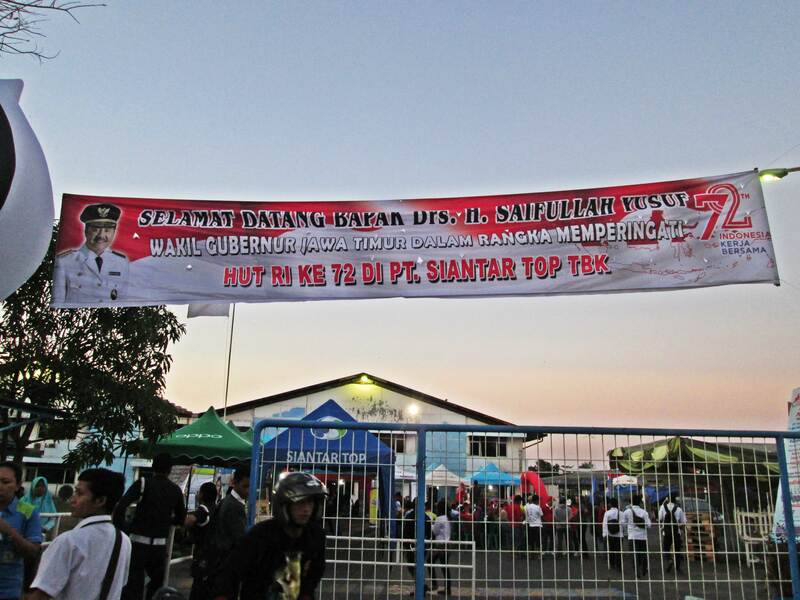 Siantar Top commemorates the independence day by organizing public bazaar. This year, the public bazaar was held for two days start on August 26 until 27 August 2017 at PT. Siantar Top Jl. Tambak Sawah 21-23 Waru Sidoarjo. Moreover Mr. Saifullah Yusuf as vice governor of east java and Mr. H Saiful Lah as Sidoarjo regent also attended the bazaar and gave the opening speech to all visitors. There were 41 stands in the bazaar, with a wide range of food products, electronics and fashion. The bazaar was attended approximately 5000 visitors including employees of PT. Siantar Top. At the bazaar, there were some doorprizes for the lucky visitors, such as 5 motorcycles, refrigerators, televisions, bikes, gas cookers and other entertainment prizes. In 2017, PT. 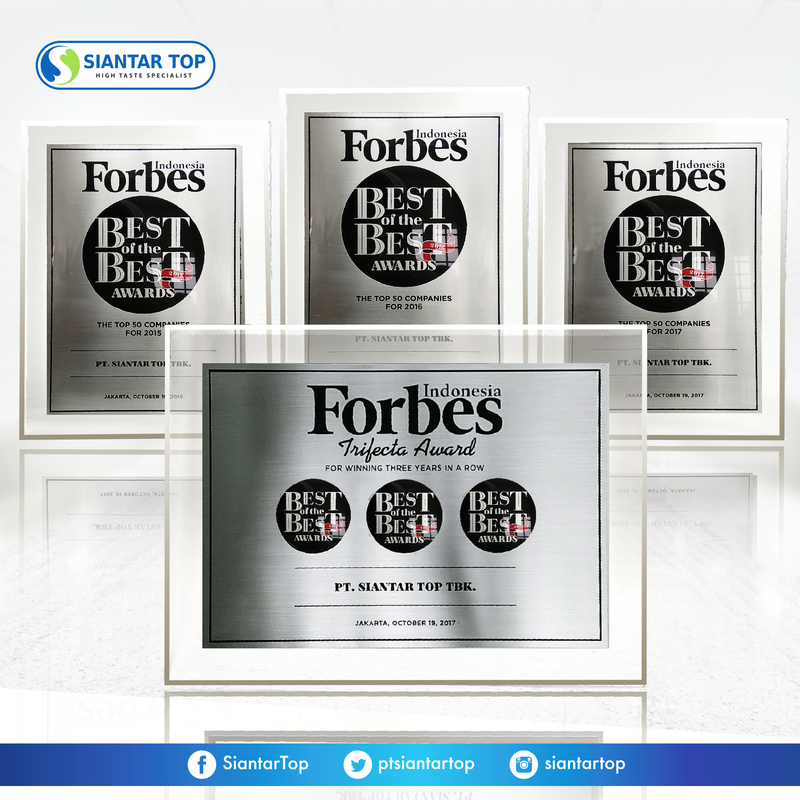 Siantar Top get the award “Best Of The Best Award 2017” from Forbes as one of the best companies in Indonesia. The award is a very valuable thing for PT. Siantar Top, because it shows the hard work for consumer satisfaction. Moreover, PT. 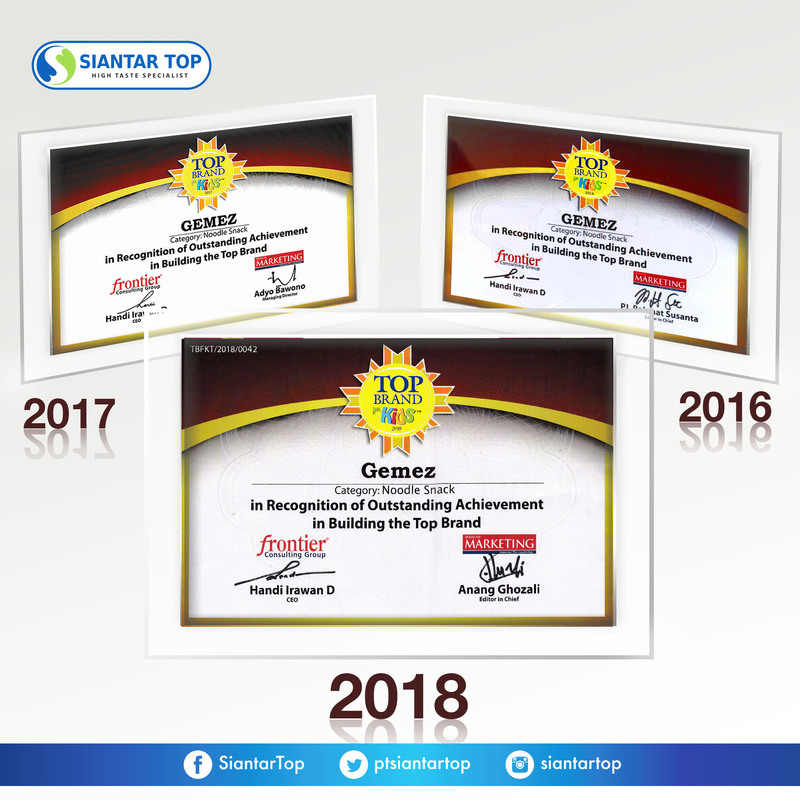 Siantar Top received the trifecta award as the company who gets the “Best Of The Best Award” for 3 years in a row since 2015. PT. 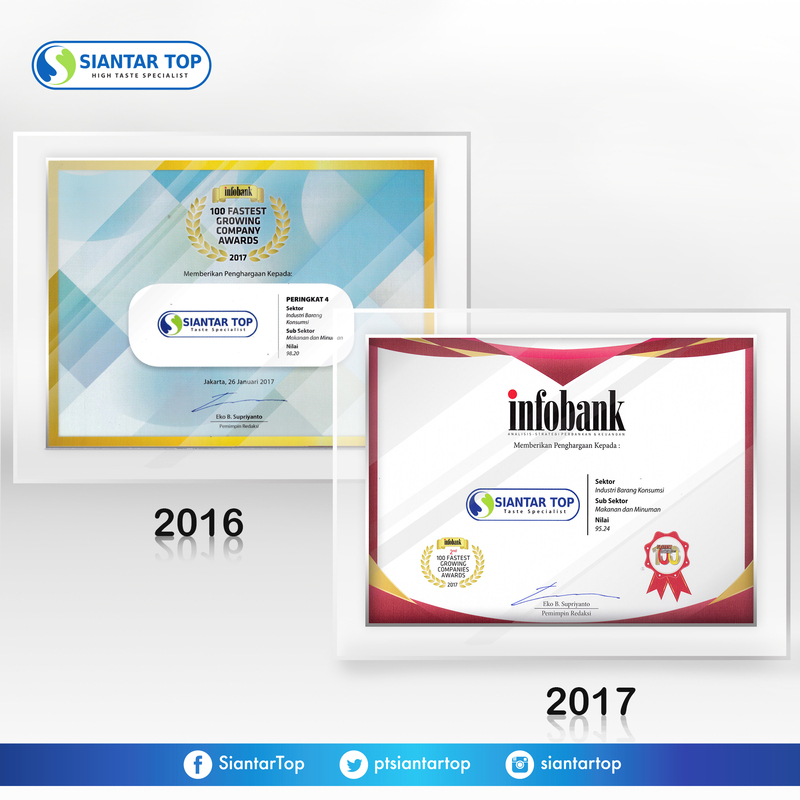 Siantar Top gives thank to all employees, consumers, suppliers, distributors, shareholder for the cooperation, hard work, creativities, and dedication to the company. Futhermore, PT. Siantar Top always wants to give the best products with the best taste for all customers. International Food and Beverage Exhibition was held by Anuga (Allgemeine Nahrung Genussmitel Austellung) on ​​7 – 11 October 2017 in Cologne, Germany. The event was held in order to promote food and beverage products around the world. This five-day exhibition could invite 165.000 visitors from 198 countries and participated by 7.400 entrepreneurs from 107 countries. Including Indonesia, there were 18 companies joined the exhibition and belongs to Indonesia Pavilion. In addition, PT. Siantar Top as company that produce snacks and biscuits in Indonesia also joined the exhibition. 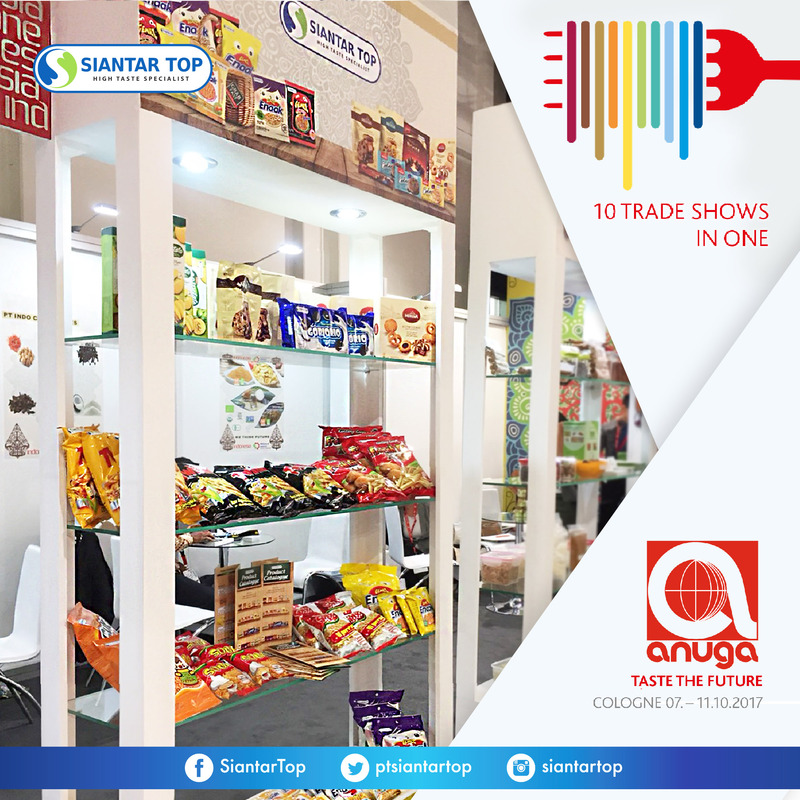 At the exhibition, Siantar Top introduce its superior product such as Twistko, French Fries 2000, Suki, Gemez Enaak, Spix Mie Goreng, Goriorio Vanilla and new products such as Modena Butter Cookies, Modena Cookies. PT. Siantar Top at Anuga exhibition 2017 was expected to get the market not only in Germany, but also the markets in Europe, Asia, Africa, and Middle East. Kami mengucapkan terima kasih kepada great people yang telah mempercayai produk-produk unggulan kami, sehingga PT. 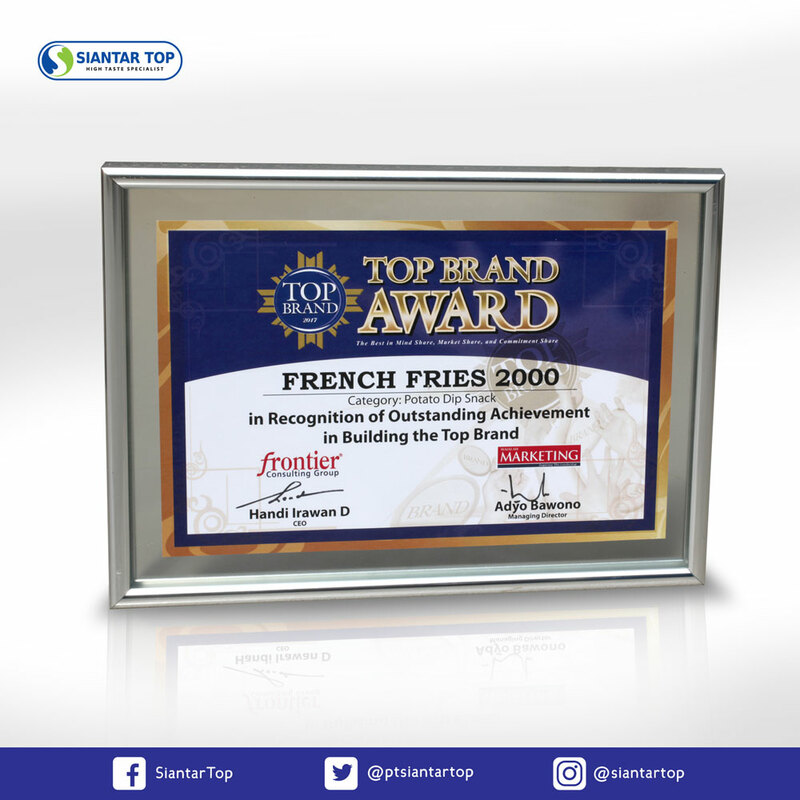 Siantar Top dapat meraih penghargaan “Top Brand Award 2017” untuk produk French Fries 2000. Karena kepercayaan konsumen merupakan motivasi kami untuk menjadi yang lebih baik. Terima kasih kami ucapkan kepada great people yang telah mempercayai produk Mie Gemez. Sehingga PT. 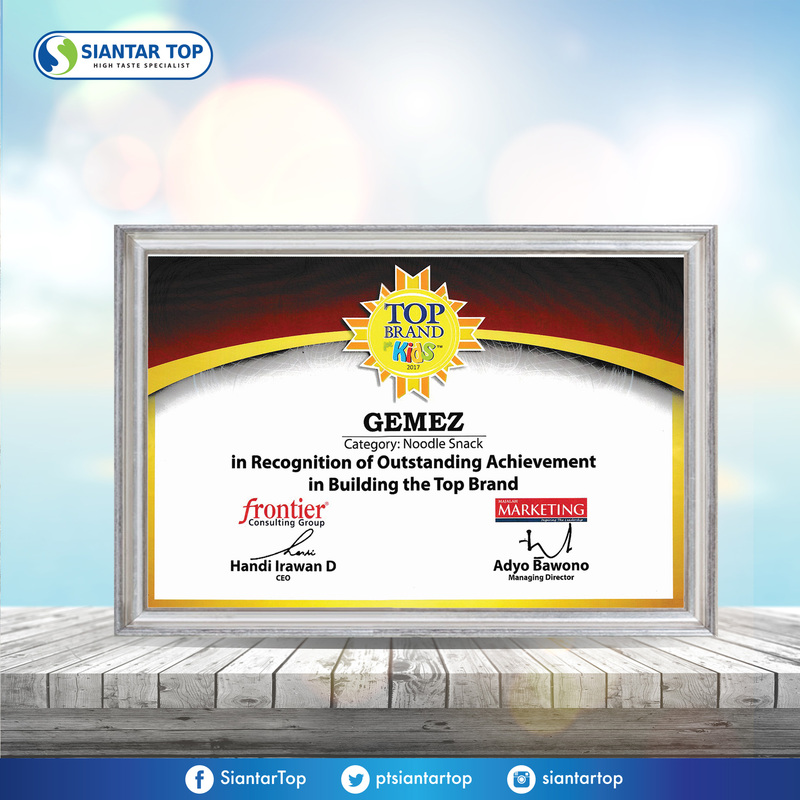 Siantar Top kembali meraih penghargaan sebagai “Top Brand For Kids 2017” untuk produk Gemez. PT. 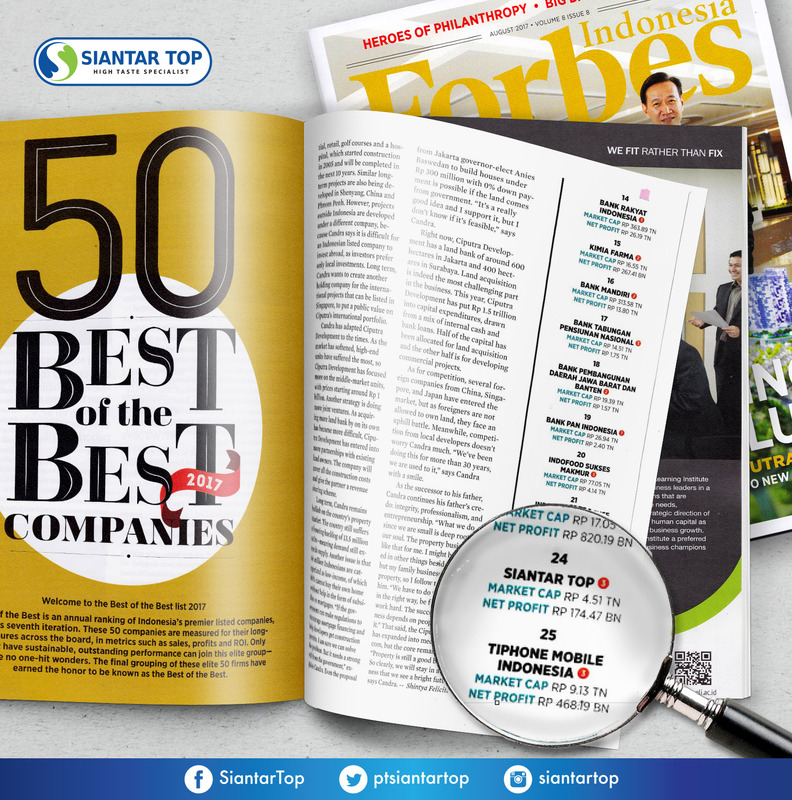 Siantar Top, Tbk received Best of the Best Award 2017 @Forbes Indonesia Magazine (for the 3rd times) as a TOP 50 Companies in Indonesia.